Beverly Hills, CA — Relevé Entertainment, in partnership with Walgreens and the AIDS Healthcare Foundation, is proud to announce the return of The Merge Summit– Los Angeles, taking place August 25-27, 2016 at The Millennium Biltmore Hotel in Los Angeles, CA. 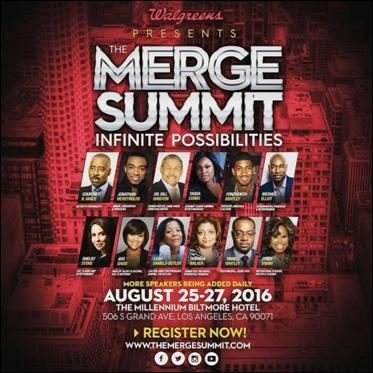 The Merge Summit is a unique event created to inspire synergy with faith based and entertainment industry leaders to educate, uplift, and encourage attendees to aspire towards their professional and personal goals. The Merge Summit will commence on August 25th with a welcoming Opening Gala. This year’s gala will honor the outstanding accomplishments of Senior Vice President of Prudential Financial- Dorinda Walker, ESSENCE Magazine Editor At Large-Mikki Taylor, founder and senior pastor of Living Word Christian Center (LWCC)-Dr. Bill Winston and Emmy Award Nominated Actor-Courtney B. Vance. This evening will be hosted by celebrated comedian-Cedric The Entertainer and will feature performances by Jonathan McReynolds and Ezekiel (The Poet). From August 26-27th, 60 top level entertainment executives will lead interactive discussions, workshops and Master Class sessions in personal branding, music, television, film, creative development, and new media. In addition to the enrichment seminars, guests will have the opportunity to participate in the Wellness Lounge® featuring a number of wellness and relaxation services presented by Wellness . This year’s festivities will also feature a faith based comedy show, CHURCH OF LAUGH LIVE hosted by actor/comedian Jonathan Slocumb, and the FREE-PHYER XPerience Concert featuring Kierra Sheard. The Merge Summit will feature participants including: Multi-Platinum Grammy Award Winning Singer/TV Personality-Michelle Williams; Grammy Award Multi-Platinum Recording Artist-The Game; Grammy Award Winning Universal Motown Gospel Recording Artist-Tasha Cobbs; Vice President and Global Chief Diversity Officer, Walgreens Boots Alliance- Steve Pemberton; Co-Chairman of De Passe Jones Entertainment -Suzanne DePasse; Emmy nominated and Peabody Award Winning Motion picture and television producer and owner of Martin Chase Productions – Debra Martin Chase; Vice President Of Talent & Casting for Original Programming at BET Networks-Robi Reed ; Head Of Talent and Casting for ABC- Ayo Davis; President of Studio Lambert- Greg Goldman; Film Producer/ President /CEO of Franklin Entertainment- DeVon Franklin; CEO of Revelations Entertainment- Lori McCreary ; Film Producer/CEO, 1019 Entertainment-Ralph Winter; Casting Director/Producer (Empire, The Butler)-Leah Daniels-Butler; Head Of Television for Will Packer Productions-Korin Huggins; Revolt TV’s Head Of Programming-Kelly G; Vice President Of Talent Development & Inclusion-Disney/ABC- Tim McNeal; Viral Faith Based Internet Sensations: NotKarltonBanks & The Playmakers; Grammy Nominated Producer- Harmony Samuels; Actresses: Meagan Good Franklin, Tia Mowry-Hardrict, LisaRaye McCoy, Brely Evans, Essence Atkins, Edwina Findley-Dickerson, Salli Richardson Whitfield, ; Actors: Cory Hardrict, Dondre Whitfield, John David Washington, Brian White; Spiritual Leaders: Pastor Wayne Chaney, Dr. DeForest Soaries, Cindy Trimm, Shawn Bolz, Pastor Mark Baker Notable Writers: Jawn Murray and Jasmine Brand and many more. For more information on Registration Packages and Ticket Purchases, please visit www.themergesummit.com. For all media inquiries and press credentials, please contact Syreta J. Oglesby or Aliya Crawford of W&W Public Relations at syreta@w-wpr.com or aliya@w-wpr.com. Integrating faith & entertainment, THE MERGE SUMMIT is a series of exclusive events that provides education, inspiration, empowerment, and opportunity. We bring together leaders in the arts and entertainment industry to teach, prepare and inspire the next generation of leaders in music, film, television, business and ministry. Our efforts revolve around providing value to our participants by providing the opportunity to meet and learn from industry powerhouses. THE MERGE SUMMIT features over 20 Interactive Panel Discussions, Powerful Master Classes and Engaging Breakout Sessions, all taught by more than 60 of the industry’s top entertainers and executives. Plus OPENING NIGHT AT THE MERGE VIP Reception- The Merge Awards™ Luncheon- Merge Showcase & FREEDOM, THE MERGE Concert Experience. Within the past year, THE MERGE has traveled nationwide with events in Baltimore, Atlanta, and Chicago! The much anticipated return to Los Angeles happens this August. Be there.